For six centuries after the baptism of Poland, since 1466, the ancient parish church in Bydgoszcz has been renowned for its reverence of the Holy Mary. Despite a thorough investigation ordered by the Primate of the Millenium, the chronicles reveal little of the history of this wonderful painting, so beloved by the inhabitants of Bydgoszcz. However, the visitation files of kuyavian-pomeranian bishops tell us, that the painting has been faithfully worshipped throughout all the vicissitudes of the ancient city of Bydgoszcz. 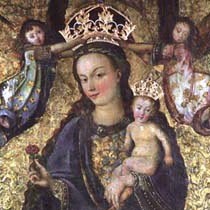 This historical examination of the cult of Our Lady in Bydgoszcz made it possible for the said Primate, who 'bet everything on Mary', to receive permission from the Holy See to decorate the temples of Our Lady of Bydgoszcz, Our Lady of the Rose, called by him Our Lady of Beautiful Love, with a golden crown. He proceeded with the coronation on May 29th in the millenary year of christianity in Poland and explained his motives as follows: 'From beneath the Heart of the Beloved Mother, the Father's Love comes into the world by human paths. Through Mary, by means of the Spirit of Love, the Father gave his beloved Son to the world'. 'And I hope that the city of Bydgoszcz will create here its Heart of hearts, will share the heart, strenghten the heart and that here it will draw even greater love'.